He feels like a colt, somehow, pride burning in his chest like half the oxygen he needs and twice the carbon dioxide, muscles taut as springs and the mending flank. There’s going to be a hunt tomorrow, a hunt, a hunt, a hunt, and he sees no one staring, maybe no one is, maybe everyone is but it doesn’t even cross his mind. El Toro slips through the crowds like anybody else and it makes him feel like a god in disguise. He is free. Free until the battle is waged on the snow-blanketed desert, free until he rips out the hearts of his enemies with horns of white marble and is known. She winds through the streets of Solterra with all the ease and familiarity of a hawk riding a thermal, but there is nothing predatory about Elif at the moment. The pegasus, too, has been swept up in the excitement, burning through the court like a fire, like the idea of it alone might be enough to melt the snow. A hunt with Solis himself - and the thought that he had been here, present, is enough to make her thrill like a girl even though she hadn’t been present. The streets today have a festival air. All that is left of the stores are on offer; few are worried about tomorrow, now their god is on their side. Around her music rises and the wind carries the beloved scents of her home, a stark overlay on the clean cold smell of snow. She is drawn to the sight of the stallion as much as the scent of the stand he’s at - the swagger of him, the gleam of his horns, the healing slash along his flank. The net of gemstones draped across his hindquarters gleams like his eyes, and her curiosity and her hunger are both so very alive. “Make it two,” she says as she draws next to him, and then flicks her gaze between the girls (one of whom she knows, and thinks a silly, vapid thing) and the big white stallion, standing proud as Solis himself. “I hope I’m not interrupting,” she adds, aiming for wryness but falling more sharp. Elif has never been as deft and nimble with her words as she has her wings. he Illusionist steps out from the darkness of Solterra’s (recently rebuilt) library and shivers. He is not made for the cold. A month of snow and ice — in the desert, of all places — has chilled Caine’s perpetually frigid mood to something so terrible and absolute, the citadel’s aging librarian had wondered, once, if the scowl had simply frozen solid along the boy’s obsidian maw. It could’ve, for all Caine cares. Scrunching his woolen cloak tighter against him, he glares into the frosted afternoon sun and watches in silence as his breath fogs into steam in front of him, a cloud of white against a sea of blasted snow. Never, in all his years, has Caine wished so desperately for one thing, and one thing only: everlasting warmth. Begrudgingly, he navigates through the icy streets, each footfall a rebellion against whatever madness the gods had released upon the land. He has heard the rumors. The gods are at fault - they are always at fault. Vectaeryn, Novus — the only similarity among the divine, Caine thinks, is their unsatiatable lust for chaos. The market gleams hazily in front of him as he nears, slivers of smoke curling into the sky from the bonfires blazing merrily in the square. They have acclimated, the Solterrans. A people of the sun and sand, and here they are, bustling like ants among the punishing frost. Their defiance cheers him, just slightly. The impending Hunt has raised everyone’s spirits, it seems, for the streets are more crowded than Caine has seen in weeks. He never used to care for being in a throng of bodies, but now he relishes the heat they provide. His black scowl lightens, just slightly. The aroma is what draws him to them. Griddle cakes — is that what they call them? — flip lazily in the air, once, twice. Golden and honey-drenched and warm. 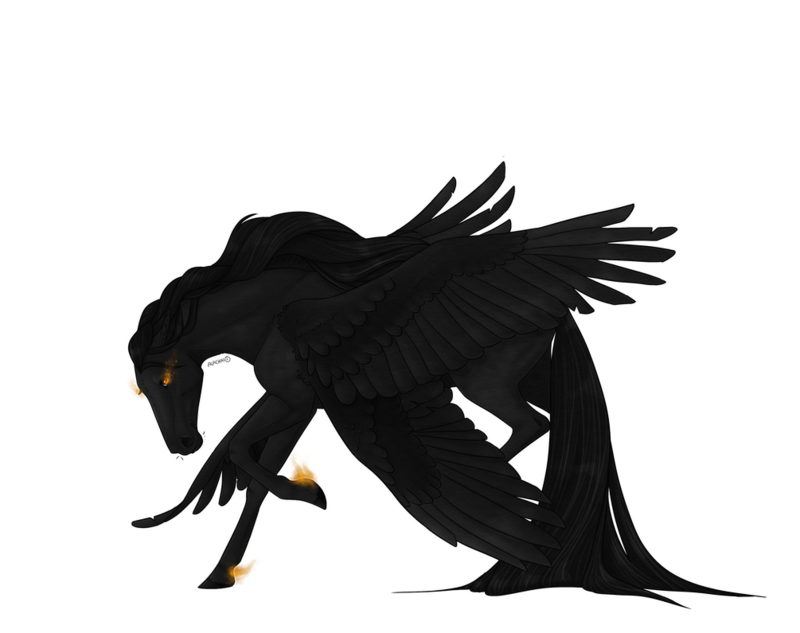 He watches jealously, a raven in the shadows, as the white stallion brings one to his mouth, and the dark mare following suit. Swiftly, he draws a coin from the depths of his cloak and approaches the booth. “I’ll take one as well.” The old man beams at his patronage, and Caine gives a cool nod of acknowledgement. As he waits for the cakes to finish, thanking (not the gods, he hates the gods) the stars that the sizzling of the grill muffles the growling of his stomach, his silver gaze sweeps, cautious yet curious, towards the others. He is too busy with the girls and the hot cake to see the pegasus, at first, but then she is there, speaking, and his ears shift at the sound of a filly’s voice and then his eyes; she is wings. El Toro’s stomach writhes into something venomous on instinct, he can’t help it, they’re always here, always in his space and between his teeth he grits, ”Hardly,” and he is certain it is the most diplomatic thing he has ever said to a pegasus since his red love. And then there is another one. Black and nearly as tall, they are two sides of a poorly made coin. Well. Toro is the good side. Alabaster and ebony, land-bound and bird-winged. Horns and dark flesh. He takes a bite out of his griddle cake, slowly, mechanically, and the girls drift away without him. He very much wants to leave, spirits gone from high to low in the flip of a hotcake but the fire still burns in him from earlier, only now it has gone blue and frostbitten, like the burn of cold, itching skin. A drop of warm rose honey slips down his chin and blip - it has gone to the ground. Opal eyes cracked with lightning fire are trained on this black creature. Near nose to nose. Toro is taller. Toro is taller. I am taller. ”Yeah, well, the cold is something.” He takes another bite out of the hotcake though he wants to slam it to the ground. He thinks he might. The bull-horned man’s response to her is more biting than her own, but Elif does not mind too much; she had interrupted him, she supposed, both in ordering and in watching that silly gaggle of mares. She is about to say something kinder, something that he would know she means is an apology - but then another stranger arrives, one who automatically eclipses her interest in the first. For he is black, and tall, and cruel-looking, and wears not just one pair of wings but two. When he leans in, when her eye first catches him, her first instinct is to smile blandly, pleasantly. But when her leaf-green gaze sweeps over him, she almost drops her own hotcake. How tall he is, how cool his silver eyes, how dark-velvet his voice - it is not difficult for Elif to picture him with blood on his hands, except perhaps for how neat his appearance is. Suddenly her heart is a bird’s against her ribs, and the honey-sweet taste in her mouth is more like sand. He speaks of the hunt, and the pale man of the cold, and ordinarily Elif would be able to tell how stiff and uncomfortable they each are. But she is lost in her own suspicion. “Solis will help us end it,” she says simply, and at least she is sure about that. It is not Elif’s way to be tactful, or sly, or use clever words to learn things when blunt ones rise so quickly to her tongue. But both the stallions are huge, towering above her and casting her own shape in shadow, and the cakes are warm on her tongue and in her belly, and now is not the time to be strong-headed. (She can almost hear her mother in her head, admonishing her, though this does little to make her want to act a lady). So she tries, when she speaks, to be friendly and nonchalant - maybe flirtatious, like the young mares who are now surely rethinking taking their leave, with two strangers so tall and handsome (never mind Elif caught between them like a stubborn burr). But all she wants to know is if the black stranger is Solterran, if he has been here long - long enough to be involved in the black market, long enough to murder her brother. “Are you travelers that the blizzard has grounded here? I’ve not seen either of you before,” she says, and only just keeps it from sounding like an accusation instead of what she had intended. Maybe another bite of the cake and the honey would sweeten her words, her voice, her suspicions - she tries it, just in case. But when she glances back at the black pegasus, her eyes still carry all the heat of summer grasses about to catch and burn. he griddle cake sizzles like hot embers when Caine lifts it to his mouth and bites. It burns his tongue, but the day is achingly cold and his stomach gnawingly empty. He chews and swallows with relish before he remembers the ivory stallion and bay mare. Lazily, he licks the honey from his lips like a cat cleans blood from its jowls. Their responses to his attempt at pleasantry are blunt and insubstantial. Caine's brow itches to arch. Instead, his silver eyes flit carefully from slender girl to horned man, narrowing just a fraction when he reads the tension carved into sullen brows. When they look at him, the hostility in the air is tangible enough to cut. Briefly, Caine wonders what it is he could've done. Never has anyone suspected him so early into their acquaintance (even when it was in their best interest to do so). He is almost impressed, until he remembers that he has not done anything. Puzzled, Caine lowers his sphinx-like gaze to the girl. “Are you travelers that the blizzard has grounded here? I’ve not seen either of you before." Her spring-green gaze on him is as sharp as a hawk's. Though her voice tries at innocence, she is not good at it (and even if she was, Caine eats lies like air and spins them just as easily) and the boy finds himself studying her like he might a perplexing painting. He gleans nothing, however, from her close-lipped mouth or her large, searching eyes. "However fierce the storm, if I'd wanted to leave I would have," he says at last, his answer as purposely vague as her question had been probing. "Solterra is large. Surely you are not old enough to have met all her citizens in turn?" He masks the taunt in his voice with a satin-smooth smile — though perhaps that made it all the more apparent. He means to say something more, but a cutting wind rips through the street before he can. Reflexively, he raises his wings to block the onslaught of biting sleet. The snow. The blasted snow. And then the thought hits him. Caine's eyes glow an unearthly silver when he tosses the snowdrift from his mane with a fluid shake. "The god Solis says that monsters who breathe ice and hiss snow are the ones who have locked Solterra into this hellish cold." He pauses, glancing weightily at the man who stands stiffly to his side, as pale as the ice underfoot. "The hunt is tomorrow, but I am not one to take a god for his word so easily. Do these creatures even exist, or is it just another one of the games immortals play when they tire of their unending existence?" His tone is not bitter, though his words might be. His voice is equal parts cool and melodic and keen. The unnatural winter has made him restless. "What say you both we have a peek for ourselves?" Caine does not know what game either of them are trying to play, but this one, the one he has offered to them on a silver platter, he has played so many times before. A game of cat and cat, none willing to act the mouse. But there is always a mouse. And it has never been him. This is a bit much, isn’t it? And he was having such a good night. ”Solis will help us end it.” El Toro snorts, because he has no faith in anything that comes from a winged mare’s mouth, even if he believes it from his own. ”Will he?” The dark one does not speak. Not yet. Toro wants to slam his teeth in the dirt. ”Are you travelers that the blizzard has grounded here? I’ve not see either of you before.” The dark one answers first and Toro’s expression remains hard and unmoving, chewing chewing chewing. What a thing to say. Pegasi are such assholes. The dark one speaks doubtfully of the gods and Toro shames him for being a heathen in nearly the same breath he shamed the girl for being faithful. ”I sure as hell hope something is there. What the hell else is there to do around here,” he snorts, and finishes his hotcake. Finally, something interesting. For a pegasus, anyway. ”I wanted to go anyway. Might as well.” He swishes his tails, looking at the winged mare, willing her to leave or agree. The white stallion prays his lungs do not pop like a bubble under hoof. First her mouth slants down at the subtle way Caine brags, but she can’t help her gaze from darting once again to his wings - like the paint stranger’s she’d met at the Oasis, they were magnificent. Nothing like the skein-thin gold of Aion’s, but the antithesis to them. This man was no Apollo, no Hermes - the dark shine of his feathers instead told tales of death. It is a good thing that his next words strike her as patronizing; if not for her sudden flare of indignation she might have asked to watch him use those double wings. “I’ve been studying her people since birth, and I know a native when I meet one,” she says, neck arching, though it would be more honest to say spying on. Elif has always been far too curious, and too fond of making up stories. Or maybe what she should have said is I would have remembered seeing you. The smile does nothing to soothe her suspicion, so she is glad when the horned stallion speaks - if his brief response could really be called that - so that she might look back at him. “Ah,” she answers noncommittally, and wonders if she should feel more or less suspicious of them both (certainly the dark man’s answer had been vague enough to make him worth keeping an eye on). For all her questions, she is glad to be standing between them when the gust hits; she shuffles her own wings against her shoulders, fluffing them out like a disgruntled hawk, and narrowly misses the cast-off snow from the stallion’s shake. And though his gaze is on the horned man’s, her own does not leave the unnatural silver of his irises as he speaks, even as her brow furrows a canyon as deep as Elatus at his blasphemy. Her first inclination is to rebuke him for his lack of faith - was not the god among them now? - but then he lets slip his question that could never, to her, be anything but a dare. “Now?” she asks, hesitant, just as the bull-horned (and, she thinks, headed) man answers too. It seems clear then that the answer is yes, she she can never bear to be left behind. “Okay - let’s,” Elif says, only just managing not to add and I’ll race you there. She is not a child anymore. But she still is the first to turn and start walking the street to the edge of the city, her shadow striping gold and white across the patches of sand and snow. She tosses the remainder of her hot cake to a scrawny yearling in passing and casts a glance over her narrow dappled shoulder to see if they follow. e doesn’t really know who to look at. The white stallion, with hatred in his eyes and menace in his jaw, or the bay mare, with distrust gleaming brighter than the red in her feathers. Tough crowd, he thinks, with a touch of drying humor. "I live here,” the scowling man says. Do you? Caine wants to say back, glancing over once again at the impeccable pearl-white of his coat. You don’t look like it. At least, not to his foreigner eyes. The girl, though — she is made for the sun. “I’ve been studying her people since birth, and I know a native when I meet one.” Her neck arches like a nervous cat’s, and Caine’s smile grows ever more genuine. "Then you are very sharp.” His wings buzz at his sides, shivering against the cold, but he pays them no mind and tilts his head just a fraction towards her. "I am not a native.” And just what… he wants to ask, are you going to do about it? Before the girl beats him to it. “Okay - let’s.” She pushes past him, resolute, and Caine pauses for a moment to watch her stretching shadow. "After you,” he remarks, voice low and lyrical and feral. He does not look back at the man — his pride does not allow for him to be the last at anything — before he picks up his stride and catches up to her in two long steps. "Neither of you have bothered to tell me your names, you know,” he says, and he makes sure his voice carries in the wind to reach the stallion’s fine-tipped ears.